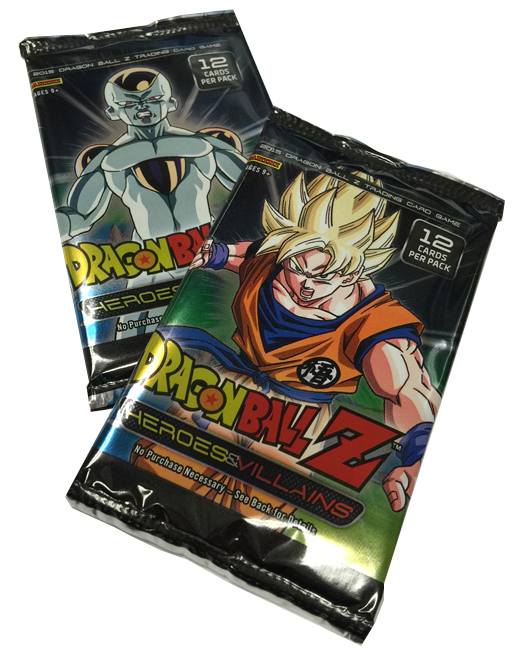 Panini America Dragon Ball Z Brand Manager Aik Tongtharadol surprised me earlier today with one hot-off-the-presses box of the company’s highly anticipated Heroes & Villains Booster box. Almost before he turned around and left the marketing office, I had the box opened and the first few packs ripped. In the Teaser Gallery that follows, we take you pack by pack through that box, which delivered 24 Rares, eight spectacular-looking Foils and a fascinating array of imagery. Enjoy the eye candy below and stay tuned to the official Panini America Dragon Ball Z blog for continued coverage of Heroes & Villains, which is slated to release on Friday. This entry was posted in Blaster Box, Card Gallery, Dragon Ball Z, Entertainment trading cards, Foils, Rares and tagged Booster Box, Dragon Ball Z Trading Card Game, Heroes & Villains, Panini America. Bookmark the permalink. Those are the craziest foils I’ve ever seen for a card game I’ve played. Cool foil pattern, but not sure how much I like the silver boards. They almost look fake. Can’t wait to crack my box on Friday!!! Im just hoping mine are here by friday. Those storms aren’t fun. Yes! Foil patterns like this forever! i like the older foils better, i loved the subtlety and the pattern on them. these new ones look a little to juvenile for me. I’m so glad that the foiling is actually visible now. Looks good and can’t wait til Friday! I like the foils, but I’m not seeing any of the stuff I like to collect. I love the way the new foiling looks except for the boarder. I think they would look so much better if the boarder was black. I’m not 100% sure about the foils. They look neat, but they also look like what you pull out of those 3 quarter vending machines… Giving it a wait/see approach before i get excited. I’m getting flashbacks of Yu Yu Hakusho on those foils. What was it, Gateway? Betrayal? Gotta find my old cards. Opened 6 boxes and pulled 4 ultras and a complete playset of every rare with a few above and beyond a playset of a couple cards. Love the new foils, they look sick. I like the new foils more than I liked the foils in Set 1. Step in the right direction. I think with black borders, these would be perfect. foils look good. Havent seen any like this for dbz its a great idea and my community loves them. Old players of dbz should notice they are just like the x promos like body slam and vegetas energy focus and they had silver boarders. I just wanna know who to bring this up with cause if that was supposed to be an ultra rare I feel I’ve been ripped off. Visit http://www.paniniamerica.net/faq.cfm and click on ‘Start a Request’. Select ‘General Question’ from the dropdown and submit. You may need to register at this point, afterwards type the description of the issue and then continue.